Well, we made it to the one year mark. Did you know that most bloggers give up within their first 3 months? I have lost count as to the number of blogs I saw pop up over the last year that are no longer active. It’s sad, but it is also why you never really have to worry about competition. Most people are not willing to put in the work to get through the dip. The other reason you don’t have to worry about competition is that the internet has absolutely crushed the bell shaped curve. Not to geek out on you, but before the internet, there was a lot more conformity (normal distribution) in the world. Before the internet the big corporations controlled the communication platforms. That has changed. And not that everyone is trying to make money at blogging, but if you are, the long tail of the distribution curve is why the concept of 1,000 true fans works. If you haven’t read Kevin Kelley’s piece on the concept of 1,000 true fans, I highly recommend it. In a nutshell, Kelley explains that it only takes 1,000 true and loyal fans to make a good living online. It doesn’t take millions. Think about it this way, if you had 1,000 true fans that paid you $100 each, you would have a $100,000 income (a decent living by most standards). The point I am trying to make is that on the long tails of the distribution curve there are infinite niches and personalities. The people that are attracted to you and resonate with your message as a blogger are not going to be attracted to every blogger in the space (which is good for all of us). So, as a blogger, you don’t have to worry about competition because most people are going to give up, and there is an audience for everyone who is willing to put in the work and leverage the long tail of the distribution curve (just don’t go too far to the right or left tails, that you’re the only one that exists out there on the distribution curve). Hopefully I didn’t lose everybody here. When GYFG hit the 6-month mark I wrote up a post and mentioned that blogging was a lot more work that I had expected. This seems to be a recurring theme from other bloggers around the web as well. But then again, what new activity isn’t hard in the beginning? When you were a baby, did you quit trying to walk after your first fall? Of course not, you kept trying until you finally were able to walk and then eventually run. Blogging is no different. Guess what? Your finances work the same way. Everything in your life works the same way. You’re not good in the beginning, but you get better over time. Starting and growing a blog is a lot like learning to drive a car for the first time. Remember when you went out for your first drive and you had so many things to think about. It seemed very unnatural and mechanical. And then one day you were on auto-pilot. You get better through repetition. You have to get your reps in. You figure out the right way by doing it the wrong way first. You need to decide on and purchase your domain. You need to register for hosting (I used bluehost when I started, but now use WP Engine). You need to choose a theme that really defines the way your blog looks (I settled on X-Theme). You need to write content. You need to set up other plugins to allow for measuring your success like Google Analytics and Web Master Tools. You need to set up social media accounts. You need to promote the content you write. You need to guest post. You need to figure out how to start building an email list. You need to reply to comments from your readers. And a ton of other things that are escaping me right now. Over the past few weeks as I’ve been thinking about writing this post reflecting on my first year of blogging, I started thinking that I wish I had an all in one resource that walked me through step by step what needed to be done. So, I decided to take the time and create that resources for YOU! The above is a very high level list of things you need to think about when it comes to blogging. If you want a more detailed step-by-step guide, then I highly recommend you check out the guide I have created in the menu bar to the left of this post (titled “Start a Blog“). This dedicated page will go deeper on everything I talk about in this 1-year update. It’s a work in progress, but it will cover how to launch, grow, measure, and monetize a blog. You can also check out the details of my first 6-months of blogging here (in case you missed it). It should help keep things in context for you as you read through the rest of this post. Everyone wants to know about monetization and I’ve been promising to talk about it for months now. When I did the first 6-month check in, the GYFG blog was just barely a month into any form of monetization. It felt pre-mature to go into any detail then, but with a good 6 months of history, the time finally feels right to give you all some insights into what is working to generate revenue for the site. The two biggest sources of income for the blog are from advertising and affiliate marketing. Well, besides a one off consulting session (thanks Chef of Fry That Financial Fish), this is really the only form of monetization that I have deployed on the blog. Admittedly, they are also the easiest forms of revenue streams to get started with (i.e requiring the least amount of time and effort). It is essentially like flipping a switch on and off, at least if you are using wordpress, which I highly recommend to anyone looking to get into blogging. There are a lot of mixed emotions about whether advertising is worth it or not. Some readers really get turned off by a site that has ads, so there is a trade off. For example, the bounce rate on my site before ads was less than 50%, since deploying my ad strategy it has risen to 62% at its peak. I am still trying to get the right balance of ads to content and their placement. The most popular or at least the most well know ad network out there is Google Adsense. Anyone with a website is eligible as long as you are 18 and in some cases as long as your site is at least 6 months old. Once you sign up for an account you can easily create your ads and generate the java script that needs to be placed on your website in order to display ads and get paid. Once you place the ad code the income is passive (well kind of, you still have to produce content worth reading). If you are just starting out with ads, then Adsense is a good first choice. For displaying ads with AdSense for content, publishers receive 68% of the revenue recognized by Google in connection with the service. For AdSense for search, publishers receive 51% of the revenue recognized by Google. These percentages are consistent, regardless of a publisher’s geographic location, and are not in any way averaged between publishers. This seems pretty fair for the amount of work that is involved. Of course you still have to produce the content. I should point out that the ads that are shown to the readers are contextual and/or based on previous browsing history. Have you ever been looking for a product and then you see an ad for that product on another unrelated site? That is what they call remarketing (some call it stalking). The website with the product you were looking into dropped a cookie in your browser so that they could remind you and try to convince you to come back and buy. Besides Adsense there are many other ad networks, but many of them have a monthly page views hurdle to get over (many I looked at were looking for 20,000 to 80,000 page views a month). However, I did find a few ad networks that were just as easy to sign up for as Adsense. There is a lower threshold for payouts of your share of the advertising Revenue. Google has a $100 minimum threshold for making payments. Where a Ad network like SOVRN have a $25 minimum. The Revenue share is higher. The revenue per 1,000 impression (RPM) is better. Besides these 3 differentiating factors, you also have the ability to run multiple ad networks on your site and make them compete against each other. But that is a bit out of scope for this post, and something I am still experimenting with. But if you want to read more about it, it’s called setting up an Ad Waterfall or a Daisy Chain (Jason Leake actually does a fantastic job deep diving into this world of advertising). BTW, if you want a great book on Adsense and optimizing it for maximum revenue, then you should check out this book (Adsense Secrets 6). There are hundreds and thousands of affiliates to choose from out there. As an affiliate for a product you act as an additional sales channel for the company and any sales that are tied back to your links earn you a commission. How do you choose which companies to become affiliate for? The rule of thumb is to only promote products that you have used and that you think will benefit your readers. You never want to promote something just for the commission, but if you know, like, and trust the product then it is a good candidate. 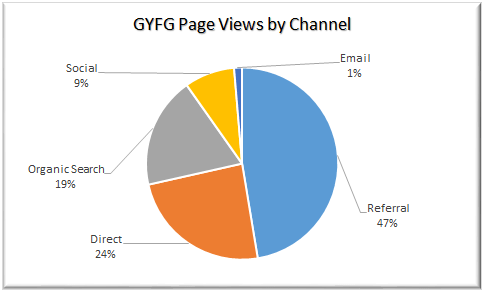 Most of the companies I have been promoting on GYFG are accessed through an affiliate network. But there are other companies like Bulletproof Coffee that manage their own affiliate program directly. Flex Offers – This is an affiliate network that I am currently using to promote Personal Capital, Prosper, and TD Ameritrade. Both of which are products I use on a regular basis. If you would like to sign up to promote these or others in their network you can use this link (full disclosure – It benefits me too). There are over 5,000 different companies in this affiliate network that you can sign up to promote. Highly recommended as a first time affiliate. Amazon – This doesn’t pay a huge commission (4-6%), but anytime you have a book or product you are talking about, there is a good chance it is on Amazon and you can add an affiliate link to it. What’s even better is that Amazon gives you credit on any product they buy within 24 hours of clicking your link. Conversion are very high on CTR’s as well (8-10% for GYFG). This also gives you access to be an affiliate for Audible as well. Bluehost – This is the company I originally signed up with for hosting and it’s where I bought my domain. I still highly recommend it for new bloggers starting out because it is super easy to set up and very affordable (at $3.95/month if you use this link vs. $5.99 when you go there directly). They have a one click wordpress install (so easy). WP Engine – This is the hosting company I upgraded too from Bluehost as my site started to grow in popularity and traffic. It is significantly more expensive than Bluehost, but it’s like comparing apples to oranges. They manage all of your updates for you. They make daily backups of your site. They have unparalleled security. They have a lot of technology built in that will allow you to get rid of many plugins. Their customer service in unmatched in my opinion. If you can afford to pay up and you want to make your blogging life easier then definitely check out WP Engine. And if you choose the annual billing option (with my link), you get two months free. I am actually promoting them through another affiliate network ShareASale. Bulletproof Coffee – All I can say is don’t knock it until you try it. If you want to feel like Bradley Coopers character in the movie Limitless, then you have to give this coffee concoction a try. Not only will you get the best cup of coffee you have ever head, but you will have mental clarity and focus that will blow your mind. I highly recommend making it in a French Press . Team Beachbody – This is actually an affiliate program that you have to pay to be a part of. I actually originally signed up in order to get 30% discounts on the supplements and workout programs that I already buy from them. The monthly cost is $15.95/month and you get a 30% commission for any sale made from your links, as well as enjoying 30% off for any of your own purchases. One of the products that I buy almost every month is Shakeology, which saves me 2X the monthly cost of membership all by itself. They call it becoming a coach (affiliate is same thing). This is just the small list of the affiliate programs that I am a part of that have the products that I use from companies that I know, like, and trust. Use these as a starting point, but please try to only recommend products and services that you have had a positive experience with. At the very least, even if you don’t have experience with a particular product or service, only recommend things that you truly believe will add value to your audience. On the home page of the blog I am currently only running two ads (and 1 affiliate), this is really a function of the effect the ads seem to have on the load time of the home page site. For some reason the ads seem to interfere with the loading of my masonry style blog. It has taken up to 1-minute to load in previous tests when I had more ads. For me, this is unacceptable, as my goal is for a page to load at 3 seconds or less site wide. Especially since I still have something like 43% of my traffic enters through the home page. On every other page the ads don’t prevent other elements of the page from loading so there are up to 10 ad slots on a blog post page (can be filled with ads, affiliate links, or my own product). With only 2 ads showing up on the home page, I estimate that my ad revenue could be 3X higher than it currently is once I can get this resolved. The ads that show up are rule based and are triggered based on whether you land on the Home Page, a Blog Post, or a Dedicated Page (from the Menu Bar). In the below screenshot I am going to show you what the ad set up looks like when all possible ads are shown (10 slots in total, which only occurs on a blog post). These slots are identified in red below and are either marked as an affiliate link or an ad. If everything is triggered to display you will see 3 affiliate links and 7 ads. I know, the layout of the ads and affiliate links is nice to know, but how much money have you made so far? This is really the part you have been waiting for right? Since turning on and experimenting with monetization in March of 2015, the GYFG blog has earned $807.02 directly from advertising and affiliate links (through September 30, 2015). I say directly, because I believe that the blog has indirectly helped me to increase our income from offline sources as well (post for another day). Above is a very high level summary of my sites stats. The line chart represents the growth of page views since the inception of this blog on September 25th, 2014. Since it is not very easy to see the monthly numbers in the chart from Google Analytics, let’s take a closer look with a chart created from the Google Analytics data in Excel. The chart below will give you much more color with respect to monthly page views. You will notice that the blog has hit a bit of a plateau over the summer, until recently making a new high in September. The first notable spike in page views came in February when two of my first guest posts went live (here on Financial Samurai and on 1500 Days). I have to give a huge thank you to Sam and Mr. 1500 for helping me get on the map in the personal finance space. This is a good time to mention how important guest posting can be in growing your blog. The key is to make sure it is a win/win for you and the blogger hosting your guest post. As you can see, this resulted in a new set point for my traffic. I already covered the specific things I did to jump start my traffic in my post about my first 6 months of blogging here. The other notable spike in the chart above is the spike that happened in May. This was largely due to a single share from the Penny Hoarder on their Facebook page (where they had a massive 600,000 fans at the time). This was an exciting and a bummer of a day. It was exciting because GYFG got the chance to get in front of a massive new audience. The bummer part was the fact that my site actually went down for about 4-5 hours, because I was in the middle of a site migration. I was switching over to WP-Engine hosting from Bluehost. Ironically, I was actually switching hosting services in order to prepare my site for the increase in traffic I knew I was going to get from the Penny Hoarder Share on Facebook. The timing just didn’t work out like I thought it would. I want to thank all of the other bloggers not already mentioned for the opportunity to guest post and share my story with their communities (links below are my guest posts on their sites, if one exists). Some of them provided guest posts for my site. This is not an exhaustive list, but these are the blogs that have referred the most amount of traffic to my site. To everyone listed and even to those not listed…THANK YOU VERY MUCH FOR HELPING ME GROW MY BLOG. This chart can be a bit misleading since it is the aggregation of all page views by channel for the past 12 months. Because of this, I would like to provide one more chart that shows you the breakdown over the past 90 days, which I think is now more representative of where the traffic is coming from these days. During the first 6 months of blogging, more than 60% of the page views were from referral traffic, mostly from guest posts and comments I left on other blogs. When you start blogging, you get almost zero Organic traffic (traffic from search engines like Google and Yahoo). Blogging is really a time and consistency game, the longer you are in the game, the better you will do. That is true from both a traffic and revenue stand point. This post is now pushing almost 4,000 words as I sum things up. The growth of the site has exceeded my expectations and was really only possible because of how friendly and helpful the personal finance community is. There were many lessons learned and new skills acquired over the last 12 months that are going to only help push this site and its message even further in the next 12 months. Blogging is a lot of work but it was so worth the effort to have the privilege to interact and share my story and message with so many of you readers over the past year. THANK YOU TO ALL THE READERS PAST, PRESENT, AND FUTURE. Want more? Check out a post my buddy Matt wrote on 50 reasons why you should blog. I am about to enter the busy season for my job. I am trying to increase the quality of the content with more charts and data. And finally, I need some time to work on marketing the blog to continue growing the audience. At some point in 2016, I will pick the pace back up at 2 posts per week. But for now I am only going to commit myself to 1 post per week through the end of the year. There may be a bonus post here and there. That’s amazing. Congrats on making it to a year, on your rapid ascent, and on many more years to come. Looking forward to blogging along side your for many more years to come. AWESOME. What a phenomenal post to share GYFG! Thank you so much. As you know, I’m a newer PF blogger trekking through the “dip” (5 months in), and this type of transparency is so inspirational and helpful to me (this post will literally save me hours and hours of time!). Likewise, you’ve been incredibly helpful offline too. 1 YR has literally flown by. Thanks for the kind words my friend. Thanks for sharing this info & naming the specific sources of income instead of just $x from affiliates and $x from advertising. Also motivating to see that your blog has grown & you can be successful in the blogosphere. It sounds like you have a good plan in place for the coming months & I look forward to reading your future posts. No reason any of this should be kept secret. Thanks for my guest post a little while back as well. Thanks for the kind words Mr. Zombie. Glad the honesty and transparency resonates with you. THANK YOU FOR PROVIDING YOUR GUEST POST. Way to go, GYFG! Always enjoy your perspective, insight and enthusiasm. There is so much cr@p out there (it deserves to wither and die!) so it is nice to see a blog like yours cut through the rest of the sturm-und-drang. Continued success to you and Mrs. GYFG, both on-and-offline! The feeling is mutual. I always enjoy your perspective in the comments. Looking forward to your next guest post 😉 whenever you’re ready. Glad I could be a small part of your first year in the blogging world, we are both very similar in the amount of time blogging, I hope to continue with you sharing our story and our progress. Cheers to you sir! Congratulations on your continued success. You are killing it! I too enjoy your writing and perspective on things, as well as your outlook. It’s true, a lot of my peers in the last 4 months have stopped blogging. We all have different perspectives and that’s what makes it interesting. I think we offer what we know, and grow along the way. Having hit the 4 month mark, and wondering if the countless hours are worth it, I am encouraged by your post. Congrats to you for hitting the 4-month mark. I know it’s a lot of work and the first 6-months are probably the hardest. I like your comment “we offer what we know, and grow along the way.” If that isn’t authenticity that I don’t know what is. That is what is so great about blogging…you get to be who you are, what your are, and where you are…while sharing your perspective on your journey on where you want to go. Although my ultimate goal is to earn some decent income from blogging over the longer term. There are many other benefits I enjoy that are non-monetary. – Some people keep journals. That never worked for me, because I have never liked my hand writing. But even if the blog were never to make a dime it is essentially my journal. Jim Rohn use to talk about why he would pay $40 for an empty book (a leather bound journal)…and he said in hope that he would have something worth at least $40 to write in it. I think a blog does that for me. – Connecting with so many of the readers in the comments and through email has been so cool. – It is also a place for me to fulfill my purpose of inspiring others through my own example. That is why I provide so much transparency. To be a catalyst to the change I want to be in the world. – A place to solidify my thinking. And I am sure some others I can’t think of at the moment. Be in it for at least a year, then decide if it is right for you. I hope to be blogging along side with you for months and years to come. I truly believe that there is an audience starving for your perspective and experiences. They need to read what you have to write. Sometimes we judge the success of our writing by the number of comments we get. But we have to remember that for every 1-2 readers that leave a comment, there are another 9 to 10 that are reading and benefitting from your writing…but are not ready to come out of the shadows. Here is to your first year of blogging. I look forward to reading about you hitting this awesome milestone in the next 8 months. Congrats on passing the 1-year mark! That’s fantastic! You are absolutely right that a lot of bloggers give up within the first 3 months and even more at the 6 month mark. It takes a lot of time management, learning and focus to keep a site going. But it’s also a lot of fun and a great way to connect with people and share stories. Keep up the great work, you’re doing a fantastic job! Congrats on your 1 year!!! What a fantastic year you’ve had as well. I’ll be wrapping up on 1 year here too (Oct. 24th) and can’t say I’ve hit as many milestones as you. You should be incredibly proud! I’ve always appreciated your honesty & transparency. It takes a lot to blend the world of personal finance with real life to share to the world through words. I haven’t monetized in any way yet, but I’m happy to hear it’s been successful for you! Here’s to more growth & success! Your words really means a lot. Stoked for you upcoming 1 year milestone. Glad you made it and looking forward to seeing you around for years to come. You have a message that needs to be shared with your peeps. BTW – Digging the new “Financially Audacious” series you started. Also, extra thanks goes to you for helping me get to 100 posts. Your Freedom Fighter interview was much appreciated. Congrats on one year. I just started following you within the last week. I noticed that your posts tend to be significantly longer than the posts at many of the other finance blogs I follow. Would there be any advantage to you breaking your posts up a bit (part1/part2), to leverage your time and post most frequently? Hey Conrad – Excited to have you as a reader and welcome to the community. My posts do tend to be a bit long compared to some of the posts out there. It doesn’t mean my content is any better than what is out there, although I may be a bit biased in thinking it is better than some, and likely more transparent than most. The advantage to breaking up my writing and publishing more often would really only be more ad impressions = more ad revenue. I personally kind of like to write a post and then put it to bed to move onto the next one. Maybe that is my way of saying I don’t think I am good enough to break my posts apart. And instead of pushing out 3-5 500 word mini posts, I would much rather put out a solid 2,000 to 4,000 word post that is one and done. I don’t see it saving me any time to write one long post vs. 3-5 short posts. My little brain would have a hard time switching tasks. I am usually in the zone when I write a post and don’t like the start and stop method of writing. That’s my answer…but do you think there is an advantage I am not seeing? I’m late to the congrats game, but here are my heartfelt congrats. Bloggiversary’s are a big deal. I can say that being only 4 months in… making it a year is something to be proud of! When I started my blog, I had no idea how to do anything but write. Arguably, I still have no idea what’s going on, but that first year is a big learning curve. Now you’re smooth sailing! You and me both Maggie! I stumbled my way through some tech stuff and finally settled on a design after 6-months. That relieved a lot of time once that was done. The great thing about blogging is that there are really no rules. Looking forward to your one year mark. It looks like your first year of blogging is nothing short of amazing, incredible, stupendous. I spend enough time reading about personal finance, consumer finance, and financial independence that I thought it would be nice to write down some of my thoughts as well. Always happy to see when there is a new post to read from GYFG at lunchtime. Congrats again, and now it’s time for bigger & better things! Thanks Jacob and congrats again on launching your own blog. A blog is a great place to work through your thoughts and ideas…that is for sure. Happy to hear you enjoy the blog. Congrats on the 1 year blog anniversary. Big milestone for sure considering how many blogs become inactive after 3 months. Where are you at in your length of blogging? Way to go! Congrats on one year! Thanks for the detailed writeup. I’ve been blogging for a couple months now and this is great information to hear and absorb. Best of look in year 2! Great post – very inspiring to see how many views you’re getting and how your blog has grown! Keep up the good work. Your tips above were very helpful, and your initial blog on “first six months of blogging” really helped me get my own blog up and running. I took your advice to help me get started. Hey man – You are very welcome! Thank you for taking the time to read it and more importantly taking action. If you have not checked out my guide in the menu bar, you may find a few more useful tips (Start a Blog) that I didn’t cover in this or the “first six months” post. Congrats on making it through Year 1! The first year of blogging is definitely a grind. The results aren’t always pretty and sometimes it is easy to feel disappointed, but if you stick it out goods things will happen. I can’t believe how detailed your post is. There is a lot of great information in here for fellow bloggers like us to dissect, compare, and possibly implement on our website. This is the first time I have visited your website, but it definitely won’t be the last! I tend to share as many details as I can. Congrats GYFG! Keep it up. You have to be coming up on your 1 year mark soon right? Hip hip hoeray with your first year of blogging. Thx for the content that you share. You dig deep into the subject and are very responsive via comments/emails. Happy to hear that you find the content interesting. Interacting in the comments and emails is one of the best things about blogging. 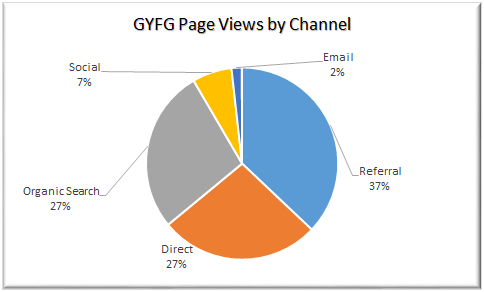 Hi GYFG – Congrats on the 1st year of blogging! I know I’m late on this but I really wanted to congratulate you even if that meant a super late comment (hope you had a good thanksgiving btw ;). You have provided interesting insights on audience building and monetization, that is useful information and, obviously, you’ve done great so far. It looks like you’re in it for the long run and doing all the right things, so I’m wishing you all the best for the 2nd year and many more. Thanks for the great post. I’m currently in the first six month phase and really just focused on the consistency you mentioned. I’m saving this post though and planning to revisit all the tips in three months, it gave me a great game plan. Thanks again! Glad you enjoyed it Fit Saver! Congrats on 6 months in, keep strong, here is to the next 6 months. Man what a machine you are! 🙂 I’d give you a high five now although let’s make it a virtual one..
It’s really inspiring to see you run through a post like this..
A nice mix of technical numbers & commentary..